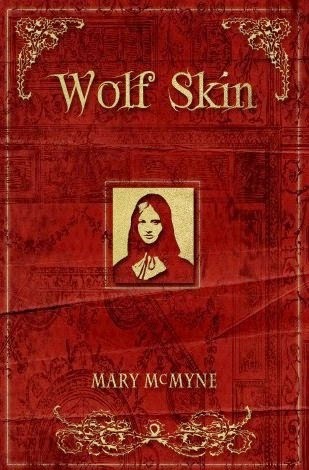 Last month I received a review copy of a slender but charming chapbook, Wolf Skin by Mary McMyne. The book is published by dancing girl press and isn't available from other booksellers. Most, but not all, of the 19 poems hidden within the pages are fairy tale related. 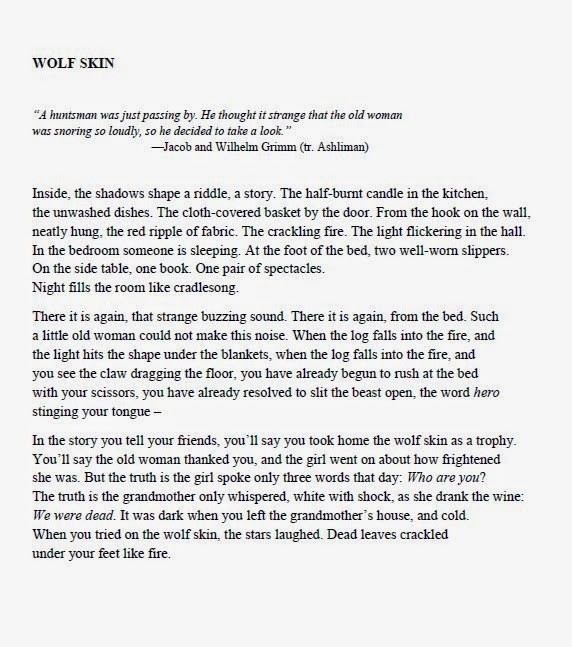 An image of the title poem is below, courtesy of the publisher. Two additional poems can be read online: "Old Woman Gothel" at Pedestal Magazine and "Heyghoge" at Painted Bride Quarterly. Six of the 19 poems are a sequence devoted to Rapunzel. 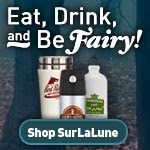 Other Grimms' tales are represented, too, such as Little Red Riding Hood, Hansel and Gretel, and The Seven Ravens. I enjoyed the poems and will let the three I've offered here speak for themselves. Poetry is such an intimate thing and I don't consider myself qualified to give a critical review of it, only a resounding, "I'm glad I read these." I admit I had a strong visceral reaction to the book because it provided a strong flashback to my senior year of high school when I took my one and only creative writing class. The focus of the class was poetry and our final projects were personal chapbooks. I still have mine and a few of my friends. So holding a chapbook in my hands again for the first time in a while brought back some strong memories of that year as well as the insecurities of publishing my work. Twenty-four years later I am grateful to not be a high school senior anymore! And while none of that youthful poetry was fairy tale related, my favorite poem from that time was inspired by an Aesop's Fable. Shades of things to come, yes? Really interesting and creative. I hope you can expound on the other poems. Maybe some excerpts with the permission of the author? Hi, new follower here. I used the links to find two of the poems which I really enjoyed. I'm going to find out if they ship to the UK so I can read some more.